After the financial tsunami in 2008, there has been a sharp drop in Hongmu. The economic situation at home and abroad is not very booming. The major demand for high-end mahogany prices is supported by investment demand. With the ebbing of the investment goods market, high-end Does mahogany furniture also hide the golden age crisis? If you invest in Redwood this year, you may have the opportunity? Most experts believe that although the prices of different wood species may be slightly different, it is not ruled out that the price of some wood species will be slightly adjusted, but this year is unlikely to have a slump like 2008. For many wood species, Instead, it is a good opportunity to enter the market. However, if it is a wood with a high "moisture" that is stir-fried, then it will be better. The precious wood species are worth noting. Yang Bo, Chairman of Beijing Yuan Henry Classical Hardwood Furniture Co., Ltd. believes that every end of the year is often the lowest point of timber prices. After January 15, the price will rise slowly. It is estimated that in March and April, mahogany The price of wood will increase by 15-20% on the current basis. Wu Bingliang, chairman of Wushi Xinglong, and Deng Xuesong, deputy secretary general of the Traditional Furniture Professional Committee of the China Furniture Association, believe that Hainan Huanghua pear has a very low possibility of falling prices due to resource constraints. Between collectors, there is little chance for ordinary investors to buy authentic products. For the Laos red rosewood, Deng Xuesong believed that some small companies had sold some of the wood for the reason of loan repayment at the end of the year, causing their prices to fluctuate slightly, but "the wood is more flexible and has better color. The price is moderate, manufacturers and consumers are happy to use, so the price of red rosewood in 2012 will be relatively stable." Wu Bingliang also believes that the demand for red rosewood in Laos exceeds supply and prices will not fall easily. The price of lobular rosewood at the end of last year saw a 15% correction. In the eyes of many experts, it is currently a time for inhaling dips. Deng Xuesong believes that before falling prices, there was a 50-60% spread between lobular rosewood and the country of origin in India. After the price drop, the price difference was squeezed away, and now it has reached the range that can be purchased. Ng Bingliang, Yang Bo and other experts also believe that lobular rosewood is worthy of attention this year. The price gap between lobular rosewood and red rosewood has shrunk. This will enable more people to put their investment eyes back in history. The precious lobular rosewood body. There is little opportunity for low-end mahogany. Although many connoisseurs believe that the price reduction of high-end mahogany furniture is limited this year, but the price of these furniture is often more than 100,000 yuan, so many small investors will look to the new low-cost Redwood species, such as wood from Africa, such as chicken wing wood. However, in view of experts, these timber investment opportunities are not large, in the view of nearly 10 redwood experts visited, African timber will not have much price increases this year, many people even bearish African timber. According to Deng Xuesong, among the 33 species of 5 genera and 8 classes in the current national standard, many belong to the wood newly classified in the redwood category. There are too many varieties of this type of redwood, and the reserves are still large, and there is no history in the short term. It is difficult to be accepted by the investment community. Of course, from a practical point of view, buying these furniture is not inappropriate. After all, the price is low and it is also durable. However, from the current point of view, although these woods do not have much investment risk, they may not have much investment value. 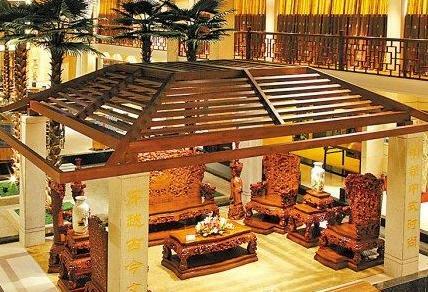 Deng Xuesong introduced that the investment value of mahogany furniture should be considered from three aspects: type, art, and material. Therefore, it is better to collect wood for furniture with similar appearance. Of course, buying furniture will have an invoice indicating the type of timber, and buying timber will generally not have an invoice, so ordinary investors are easily fooled by indistinguishable materials. Stir-fried wood species are the common name for the wood of the genus Gingeraceae and Runa. Although the wood is not one of the 33 species of the national standard, 5 species, 8 classes, and 33 species of mahogany wood, Nanmu is also a rare hardwood that has recently been madly fried. Jin Sinan is currently the lumber of the limelight, according to media reports, some of Jin Sinan's offer can reach 200 million -300 million yuan / ton. In this regard, Deng Xuesong believes that Jin Sinan's current offer is not small, the actual price is 10 million yuan / ton. For this type of wood, the average investor is less likely to touch. Some mahogany prices broadcast Hainan huanghuali: In the mahogany raw material price, the most valuable is Hainan huanghuali. The furniture produced in recent years relies on demolition materials, Hainan local agricultural materials, old furniture demolition materials, and the price is always high. No less, because the material is extremely rare, there is almost no market price. It is said that the wood that Hainan Huang Pear can provide every year is only a few thousand pounds of old material, and the quotation is 1000-2000 yuan/ton. Vietnam Pear: In recent years, scarce resources, raw forests are depleted, and Vietnam has completely banned the export of this kind of timber. The price continued to rise in 2011, and the timber price has doubled in the whole year because the material is too expensive. Many manufacturers No such furniture has been produced. The consumption behavior of Huanghua pear has shifted from home use to investment collection. From November 2010 to April 2011, Vietnam Huanghuali experienced a wave of rapid price increase. The quotation quickly rose from RMB 1,599/kg to RMB 4,499/kg, and the price surged nearly 2 times. Currently, it is in the price platform period. Lobular rosewood: Indian leaf rosewood prices rose by about 80% in the first half of last year, but the prices at the end of the year have dropped slightly after the sharp rise. The current adjustment rate is about 15%. At present, the price of good solid lobular rosewood is up to 1.5 million yuan per ton, and that of ordinary wood is around 700,000 yuan per ton. Laos red rosewood: Red rosewood is a wood that has been rising faster from 2010 to 2011, because the red rosewood is also a traditional Chinese custom timber material, and its value is also recognized. In addition, whether the material is oil toughness, density or color are Rich and steady, the material supply is relatively abundant, so it has become a manufacturing material dominated by many manufacturers. In recent years, new manufacturers have been established. The current price is around 700,000 yuan per ton, and the increase in aniseed material is more than several times, for example, The large sheets of red rosewood with a size of more than 60 cm are quoted in terms of price, equivalent to millions of tons. Fancy fabrics in general are cheap, industrially produced imitations of the wax prints and are based on industry print. Fancy fabrics are also called imiwax, Java print, roller print, le fancy or le lÃ©gos. These fabrics are produced for mass consumption and stand for ephemerality and caducity. Fancy Fabrics are more intense and rich in colors than wax prints and are printed on only one side.